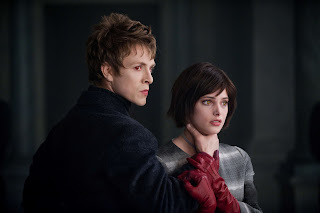 The Shiny Vampire Club: When Jill Met Demetri! On the way to the movie my neighbor and fellow Twilight lover Bonnie told us that she heard one of the Twilight cast members would be coming to one of the theaters in the Twin Cities. We all speculated which theater. My guess was Mall of America, but maybe there was a chance that it could be ours due to the Showplace in St. Louis Park being brand new. As I settled into our upper deck VIP seats with my blood red Twilight martini (super strong!) a woman came out to announce the exits and then said they had a special guest. The audience began to cheer and out came this adorable blond messy haired guy in a white t-shirt and jeans. He introduced himself as Charlie Bewley who plays Demetri. He started out by teasing the audience saying that he had an inside scoop for us that the Breaking Dawn movie would have a completely different ending then the book. There were some cheers and some boo's. He laughed and said he was kidding. Then asked if we had any questions for him. Someone asked where he was from- England. Another asked when they start Breaking Dawn? He said they start shooting in Louisiana soon and he was excited to get to fight with Aro. One girl asked if he'd sit on her lap during the movie and he said Sure why not! Then he said we're probably excited to see the movie so he better go and jogged off the stage with a large body guard. Only disappointment was that the lights were already dimmed and it was difficult to see his hotness! WOW! How cool! I think he's such a cutie! !